Wichita Room Escape in Clifton Square brings the latest group puzzle craze to College Hill. Wichita's professional baseball team. If you're gonna go...GO NUTS!!! Jump on over and check out over 10,000 square feet of trampolines, along with our foam pits and dodge ball courts. Host your next birthday party with us! South Wichita skating rink perfect for birthday parties, school fundraisers, skate nights, speed skating and other fun family activities. Multiple rooms, multiple challenges. Do you have what it takes to get out in time? 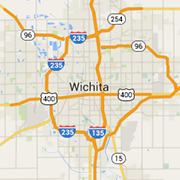 The Room-Wichita is Wichita's new form of interactive entertainment!